[…] The same is true for screen capturing with CGWindowListCreateImage still working so that an sandboxed app may capture the whole screen including the window contents of other apps without (non-existing) entitlements for that. 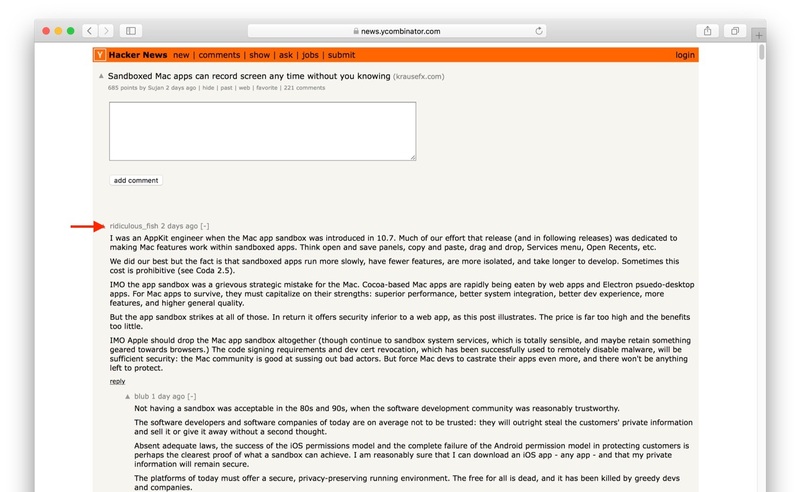 Peter Ammon, former AppKit engineer at Apple, in a comment in a Hacker News thread regarding a report positing that the ability of Mac apps — even sandboxed ones — to capture screenshots of the entire screen is a security problem : IMO the app sandbox was a grievous strategic mistake for the Mac. Cocoa-based Mac apps are rapidly being eaten by web apps and Electron pseudo-desktop apps. Q.From a developer stand, why advantages do I get from making a native Mac app compared to a web app or an Electron app?Web apps in the browser are OS-Agonstic and Electron apps can be easily made cross-platform. A.The answer is quality. As a Mac user I always prefer a native Mac app to some cross-platform app, even one with nominally more features. Superior performance. Native apps are just faster. They launch faster. They use an order of magnitude less memory. Multithreading via GCD is much much nicer than Web Workers. Large files are better supported. You can have very large tables. etc. They properly implement Mac UI idioms. By comparison even the nicest Electron-like app (VSCode) violates many longstanding expectations: it doesn’t properly highlight the menu bar when typing a key equivalent, menu items don’t disable properly, the text highlight color is wrong, text selection anchors incorrectly, no column selection, text drag and drop is badly broken, undo doesn’t know what it’s undoing, undo coalesces incorrectly, hell even arrow keys sometimes go the wrong way. It’s an island app doing its own thing.